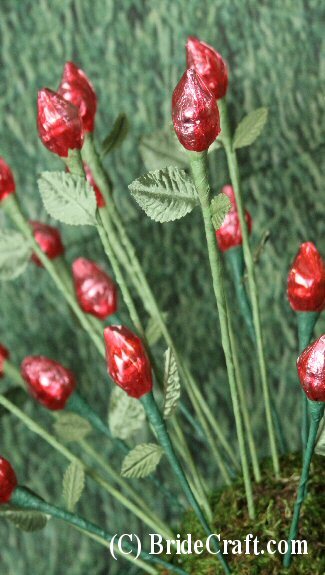 Make a Hershey Kiss Rose Favor! Need a great favor idea? 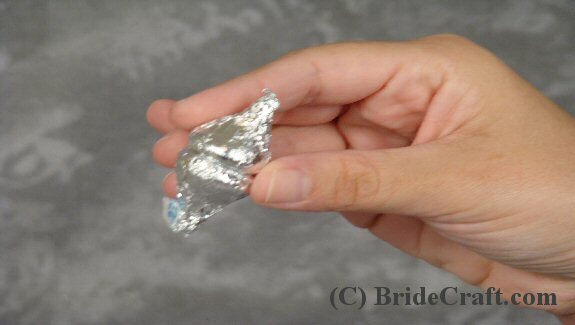 Try creating Hershey Kiss rose favors as tokens of your appreciation for your guests. Below you will find a step by step tutorial showing you how to create your own cute, sweet treat. 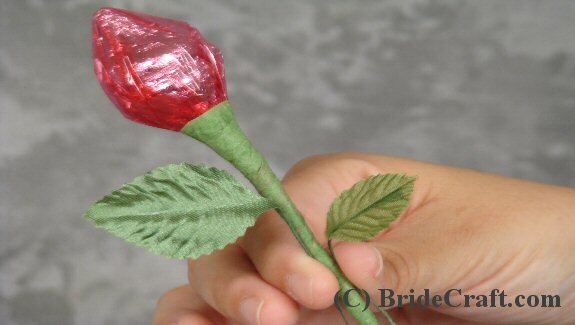 Pros: Simple construction, easy color customization and low price tag make this Hershey Kiss rose favor a great DIY wedding favor choice. 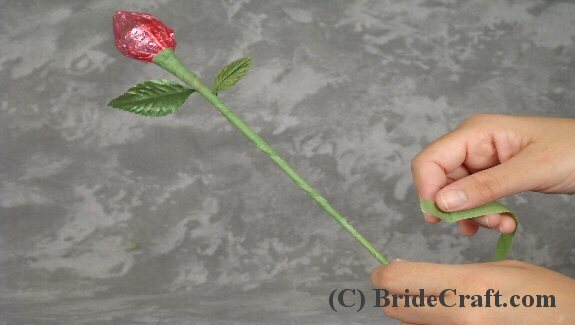 They can be made in advance of the actual wedding, and let’s face it…who doesn’t love chocolate? Cons: In large quantities, this project can be a bit taxing on the finger tips. Sectioning off the task into groups is suggested, so you don’t have to create them all at once, in one day. As this favor is chocolate, care should be taken to keep them from heat. Store in a cool dry place, in plastic for freshness. And Brides who are very figure conscious or feel that chocolate affects their skin…good luck resisting the allure of chocolate! 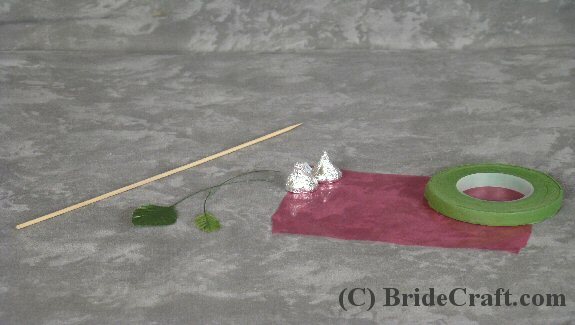 Step 1: You will need (per single favor) bamboo skewers, two silver foiled Hershey Kisses, colored plastic wrap, wired silk corsage leafs and green floral tape. Step 2: Take your two kisses and place them bottom to bottom. 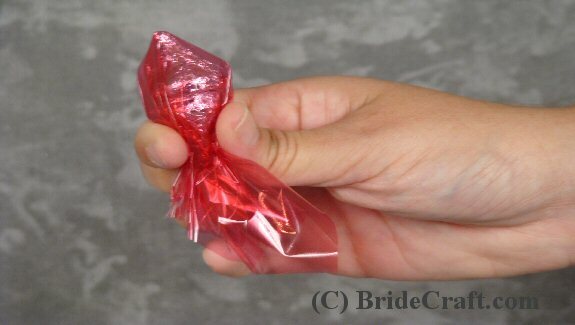 Step 3: Take your colored plastic and wrap it around your kisses. Slightly twist and pinch the base. Step 4: Take your bamboo skewer and position it within the folds of the plastic. Tip: Some people like to take the sharp end of the skewer and sink it into the chocolate. We have not done this, but you may do whatever you feel is easier for you. 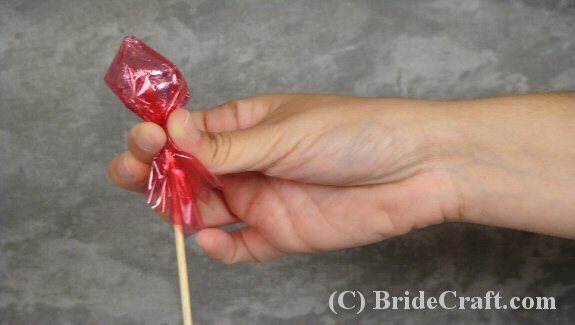 Step 5: Begin taping the plastic covered kisses to the skewer. Once firmly secured, wrap completely down the “stem”. 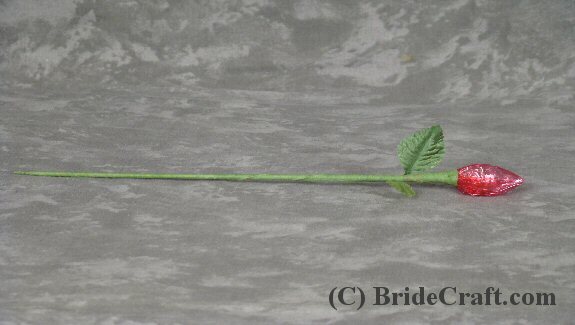 Step 6: Take your silk corsage leaves and measure where you would like them along your stem. 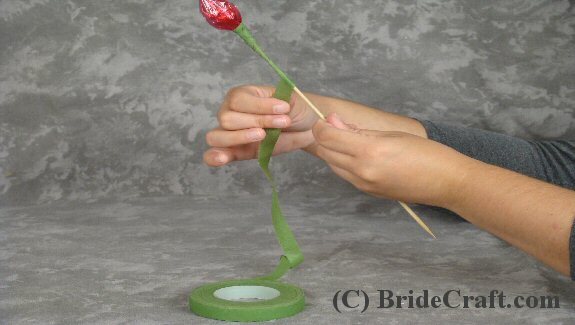 Secure them to the stem by slightly twisting the wires around the skewer. Step 7: Cover the wires with a bit more florist tape. Step 8: Your first favor is complete! Sit back and make more! Return Hershey Kiss Rose Favor to Favors Page.